how did you lovelies spend your friday night? it's okay though because i'm slowly learning to embrace it. and to be frank...i think i would look pretty funny really tan, my hair would just blend in with my skin, yikes....! well anyways i hope you all had a happy happy monday. HOW RETRO!!!! I like the bangles! I now feel the urge to pop out to the local pharmacy to get a bottle of yellow nail polish!! Love the print on your top! I love pale skin! It's more healthy, and your hair is so pretty. I actually just had sushi for dinner...so full! Hope your week is off to a great start! Your hair is incredible. I want. Was looking through your posts and I must say you have SUCH amazing style...love all the looks you put together. Really adore this outfit.. love how you tied your tank with the highwaisted shorts..and the clog shoes are the perfect touch! I get a 70s/80s vibe from it that suits you so effortlessly. You have the most beautiful hair ever!! omg gorgeous outfit! and amazing photos! 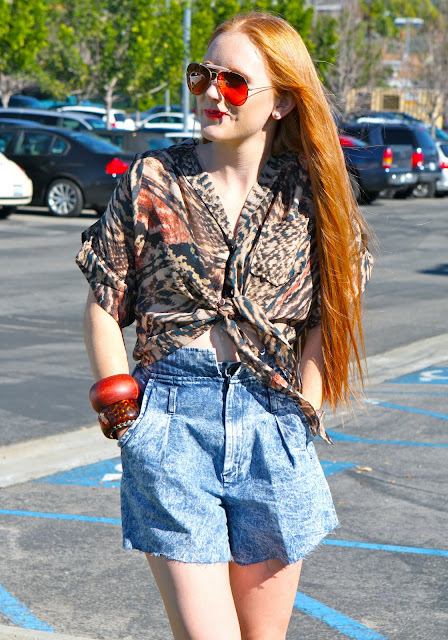 i have been looking for a good pair of vintage high waisted shorts for ages! i love yours! and the way you styled them! i love the neon nail polish!! cute blog hun! can't wait to read more! found you while "blog walking" and thought i would say a hello! -- would love it if you could visit me and follow back sometime ? your hair!!! it never ceases to amaze me. like liquid fire/gold/copper. amazing. and don't even get me started on how envious your summery weather makes me. sigh. this is so pretty! your hair and glasses look so vibrant in the pictures. LOVE the shorts! I'm extremely inspired with your writing skills and also with the layout in your blog. Is that this a paid subject or did you customize it your self? Anyway keep up the nice high quality writing, it's rare to look a great blog like this one these days..
like how well matches the colours of bracelets, shirt and wedges! This outfit is so great, love the shorts on you. Your hair is STUNNING. So jealous. Love high-waisted anything, especially with a cut like you made to these shorts! I ♥ those shorts. you look stunning.! I'm in love with your top and your shoes! Great look!! LOVE the top. the whole look is GREAT. suuuch cute shorts!! i love high waisted denim! love the bounty of bangles on your wrist, beautiful. Those shorts are awesome! and your hair wow!! The most beautiful I have seen. i looove your high-waisted denim shorts and shirt. so bohemian chic! i spent this past friday sick:( but i am on the up and up! your shorts are too awesome! and your hair is beautiful! those shorts look great on you! and i love your hair - the color is gorgeous! I am so impressed you were able to pull this outfit off - you look awesome! love this outfit! you look so wonderful! This is TOO cute! 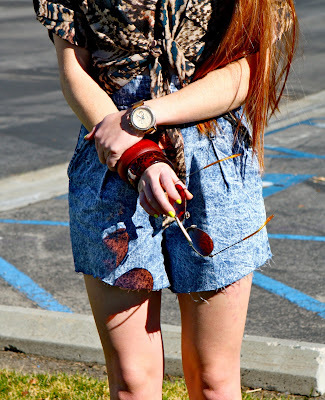 We seriously adore those shorts- your sense of style is rad as hell! I need those shorts in my life! Amazing. Your style is incredible but your HAIR WOW!!!!!!! I hope you come follow us too. PS- Would you want to collaborate by chance? Love this look hun! The colours are amazing against your beautiful red hair and I'm loving the silhouette of the shorts. The tribal top is fierce--looks great on you. You have such pretty hair! I love those shorts! glad i found your blog, it's refreshing! I love your jean shorts! High-waisted shorts are the only kind I'll wear anymore. They're the only kind that are comfortable! I love the blouse you paired them with too. Very cute! oh my god...KAITLIN...this look is SO fabulous..kinda paying a little hommage to the movie 'Almost Famous' cause of the awesome high waisted shorts and tie top!! so retro..lovin it!! Coconut oil has good cleansing and conditioning skin care properties. I always knew he struggled with social issues and was very strong willed, but I just thought it was his personality and I would just have to accept his quirky behaviors as part of his personality. Wheatgrass Powder is an ideal food supplement for vegetarians and vegans as it provides a natural plant source of protein and other vitamins and minerals that vegetarians and vegans may lack in their diets. He also says he is sad a lot of the time.